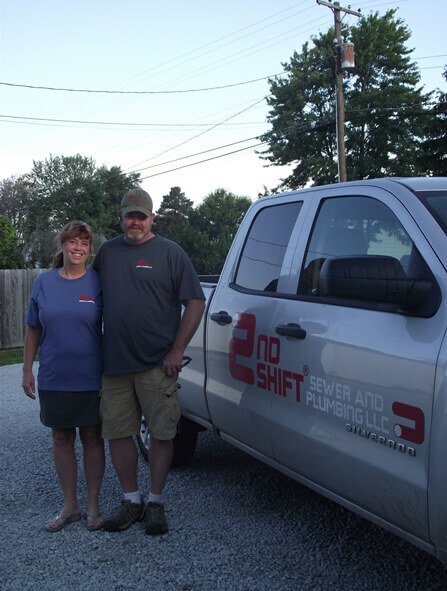 In 2010, 2nd Shift Sewer and Plumbing® was founded while Terry maintained a full-time job and was only able to provide services after hours. He saw a need in the community for a full range of excellent plumbing services at a reasonable rate. In 2012, Terry left his job and started operating 2nd Shift Sewer & Plumbing® on a full-time basis. As a locally owned and operated business, they have grown to become the leading provider of plumbing services in the area. Their focus is customer service and delivering high-quality work. 2nd Shift Sewer & Plumbing® operates under one of the most recognized slogans in the plumbing industry: “Call Someone Who Gives a Shift!”® to reflect their commitment to never charging extra fees for emergency or after-hours work. Terry and Kim want their fair pricing and excellent customer service to be the reasons you continue to call 2nd Shift Sewer & Plumbing® with your plumbing needs. Why Franchise With 2nd Shift? Honest and fair service is at the heart of everything we do at 2nd Shift Sewer & Plumbing ®. “Live the American Dream” has been our motto from the start. 2nd Shift is a business built on providing people the ability to become their own boss, live a balanced and fulfilling lifestyle, while investing in their future. The home plumbing industry continues to grow and our franchise model capitalizes on this as we help our owners deliver honest and fair service to their communities. Our business model, which offers a balanced lifestyle, allows you the opportunity to build a successful business, offer a quality place of employment, and live the American dream. By providing 2nd Shift’s genuine, honest, and fair service for homeowners and businesses in your community, you will become a trusted resource in the sewer and plumbing industry. Our team will provide you with full support as you get your franchise set up and operating, from site selection to approved suppliers. We are here to help make you and your business successful. Our business model is perfect for anyone who is a hard worker and wants the excitement, satisfaction, and freedom of business ownership. We have developed all the tools and steps needed to get started. All you need to do is apply good business practices to a great brand and you’re off and running with your new 2nd Shift Sewer & Plumbing® Franchise! As a 2nd Shift Sewer & Plumbing® franchisee, your target clients will be individuals, businesses, and others who are in need of 24/7 sewer and plumbing services. Your ability to compete in this market will be largely dependent upon management, involvement, financial strength, economic conditions, geographic area and specific location. Some of your responsibilities as a franchisee will be to manage the day-to-day operations, offer quality customer service, and coordinate, set up and manage the sales. Fill out the form today! 2nd Shift Sewer & Plumbing is currently accepting inquiries from the following states: Illinois, Indiana, Kentucky, Michigan, Ohio, Tennessee.